Big South Australian battery exceeds all expectations says billionaire. The Aussie software billionaire behind the bet that led Elon Musk to build the giant South Australian battery says so far it has exceeded all expectations. According to Mike Cannon-Brookes, the founder and co-CEO of Atlassian, the battery complex at Hornsdale Wind Farm saved taxpayers a massive $35 million in the first four months. Cannon-Brookes talked to the Australian Financial Review following the release of the Australian Energy Markets Operator (AEMO) quarterly report. Because the mega battery came online during December 2017, the report marks the first full quarter of operation. The battery can charge up when energy prices are low and release energy to the grid during peak pricing, the report finds. It is therefore both efficient and profitable. The AEMO report shows frequency control ancillary service (FCAS) costs were 57 per cent lower for 2018’s first quarter than they were in the last quarter of 2017. The Tesla Powerpack installed at the Hornsdale Wind Farm proves its worth in first quarterly AEMO report of 2018. Hornsdale Power Reserve, along with demand-side response, is credited with driving this change. This amounts to a saving of $32.7 million. Those who dismissed the importance of the Tesla battery have been proved wrong, Cannon-Brookes says. The billionaire has also become a major investor in solar farms. Cannon-Brookes points former doubters of the big battery to the financial facts. These include Federal Treasurer Scott Morrison, who dubbed it as useful as the Big Banana at Coffs Harbour. AEMO confirmed in April that the Tesla Powerpack battery array had proved more rapid, accurate and valuable than a conventional steam turbine. Because the system kicks in so efficiently, it should have made around $1 million in just a few days. However, the Powerpack discharges power to the grid so quickly the current system can’t keep up. 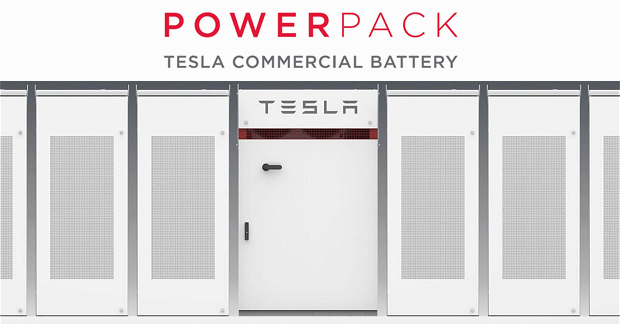 The Powerpack is the commercial equivalent of the Tesla Powerwall, which helps households save money using solar battery storage.